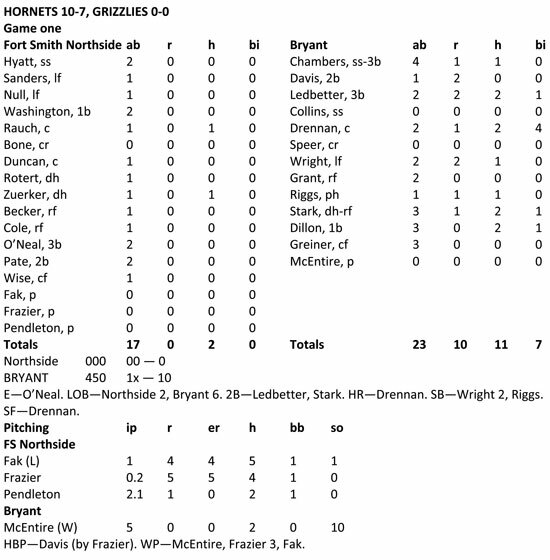 One year to the day, Bryant Hornets’ right-hander Will McEntire had the worst start of his high school career against the Fort Smith Northside Grizzlies, giving up four runs on five hits in an inning of work. 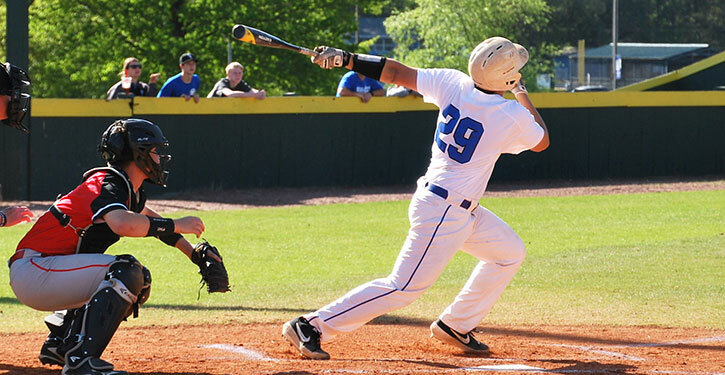 On Friday night, he got a second chance at the Grizzlies and proceeded to shut them out on two scratch singles, walking no one and striking out 10 in five innings in game one of a 6A-Central Conference doubleheader. 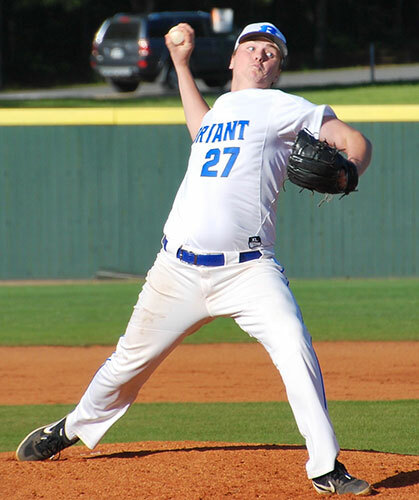 In the second game, Grant allowed just one hit without a walk and eight strikeouts over six innings then Hathcote struck out the side in the seventh. The result was a sweep, 10-0 and 7-0, as the top-ranked Hornets improved to 22-2 overall and 8-0 in league play. It was their ninth win in a row since a 2-1 loss at Sheridan on March 8. 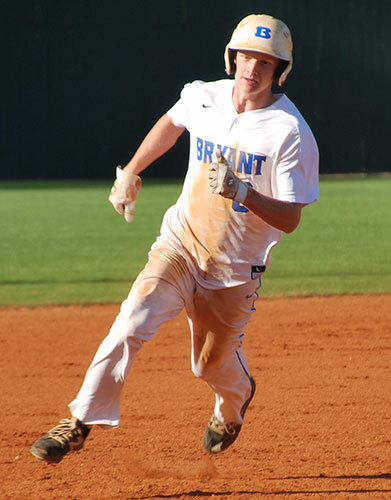 Bryant leads the conference by two games of Little Rock Catholic, which out-gunned Cabot, 12-8, on Friday. Catholic visits Bryant on Tuesday for the first meeting of the year between them. “As he told me, I had to better myself from last year,” said Hornets head coach Travis Queck of McEntire. He was frustrated about that. He kind of had to put it to bed and he did a good job. 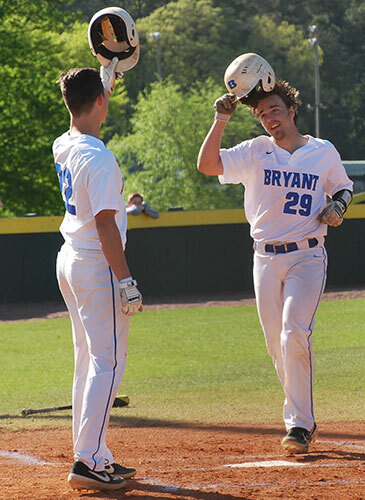 The opener was also highlighted by a three-run homer by Cade Drennan, his first of the year and the only round-tripper hit at Bryant High School Field this season. 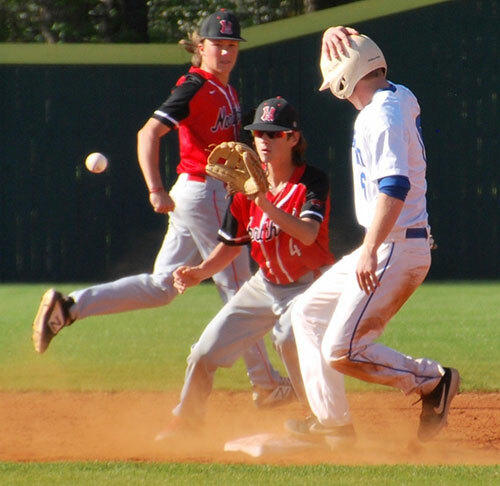 Drennan, Austin Ledbetter, Gage Stark and Peyton Dillon each had two hits in the game. 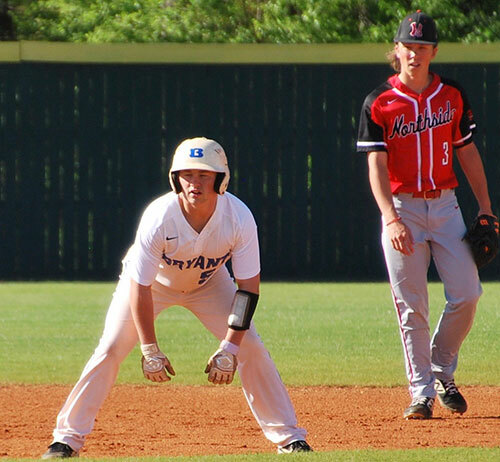 In the nightcap, the Hornets managed just six hits, but they were enough to take advantage of eight walks and two hit batsmen. “We’ve struggled with seeing different arms inning after inning after inning,” Queck said. “Our guys did a good job. They came out focused the first game. “The second game, I wasn’t too pleased with the focus but a lot of that is getting maybe one pitch (to hit) per at bat,” he continued. “Everything else may be nipping the edges and stuff. It’s one of those games you’ve just got to bear down and focus. And our guys did enough to win. The lone hits McEntire allowed were a lead-off grounder up the middle by Bobby Rauch in the second and a bloop single by Cooper Zuerker to lead off the fifth. 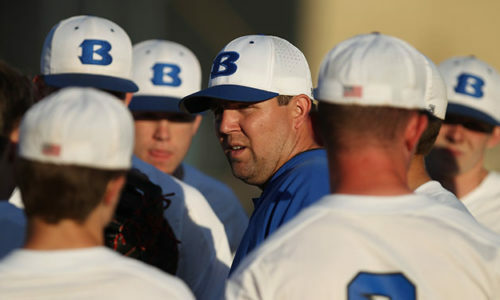 Between them, the Bryant senior set down nine in a row including six on strikes. After Rauch’s knock, McEntire struck out five in a row. The Hornets took a quick lead in the bottom of the first when Noah Davis walked, Ledbetter singled and Drennan unloaded on an 0-1 delivery. The inning continued with a single to left by Jake Wright. He stole second and scored on Stark’s two-out single. In the second, the Hornets added to their 4-0 lead. Logan Chambers singled, and Davis was plunked by a pitch. Ledbetter found the gap in left-center for an RBI double to make it 5-0. Drennan added to his RBI total with a sacrifice fly. Ledbetter tagged and went to third on the play and, after Wright had walked and stolen third, a wild pitch allowed Ledbetter to score. With Wright at third, another wild pitch brought him home to make it 8-0. With two away, Stark doubled and scored on Dillon’s single. 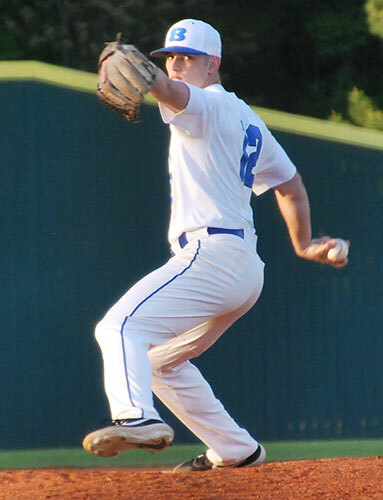 Right-hander Gabriel Pendleton became the third Northside pitcher and got the final out of the inning. 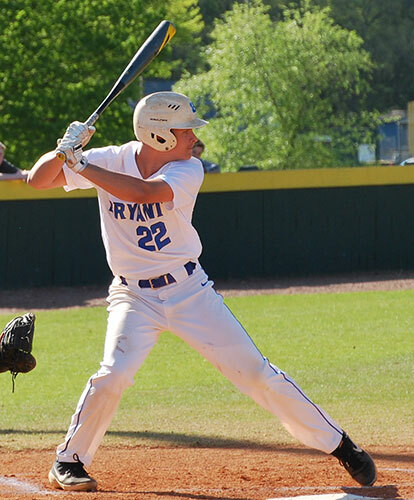 He worked around a walk to Ledbetter and a single by Drennan in the third but, in the fourth, Ryan Riggs beat out an infield hit, stole second, then scored when Greiner’s hot grounder to third was booted, making it a run-rule lead. McEntire finished with a flourish. After Zuerker’s single, he struck out the side. Grant allowed only an infield hit in his six innings of mound work. It was a bouncer into the hole at short by Rauch that Zion Collins knocked down, with no play at first. 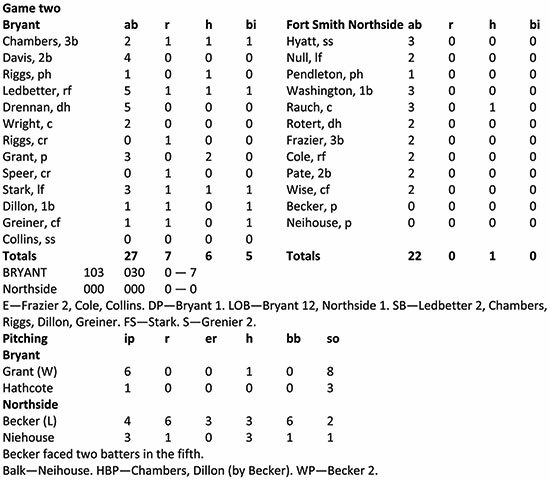 He set down the next 13 in a row before Derrick Wise reached on an error. But Kaden Hyatt’s liner to second was speared by Noah Davis, who threw behind Wise at first for an inning-ending doubleplay. The Grizzlies managed to get just three balls out of the infield, a flyout to Stark in left and two to Ledbetter in right. The Hornets scored their first four runs of the game without a hit. In the first, Chambers drew a walk, stole second, tagged and went to third on Davis’ fly to center. Ledbetter got a squeeze bunt down and Chambers slid across the plate ahead of the toss from pitcher Tyler Becker. In the second, Logan Grant got the first hit for the Hornets. Peyton Dillon walked, and Chambers was hit by a pitch. But Becker forced Bryant to leave them loaded as he got Davis to sky to center. In the third, Ledbetter reached on an error and went to second on a wild pitch. Wright walked, and the duo pulled off a double steal. Grant drew a free pass to load the bases. Stark delivered what would’ve been a sacrifice fly to right, but the ball was dropped. Ledbetter scored and, when Dillon was hit by the very next delivery, it was 3-0. Greiner picked up an RBI when he grounded into a force at third. Again, however, the Hornets stranded three. Ledbetter singled to open the fourth but Becker, a soft-tossing lefty, retired the side. In the fifth, however, Becker surrendered a solid single to left by Stark then walked Dillon. He gave way to another lefty, Evan Neihouse. Greiner, attempting to sacrifice, got a bunt down that Northside third baseman Jett Frazier got to only to throw it away at first. Both Stark and Dillon scored with Greiner winding up at third. Chambers singled him home and it was 7-0.